HOW TO: Use the CD-based Battlefield 1942 game to play on the EA117 server. 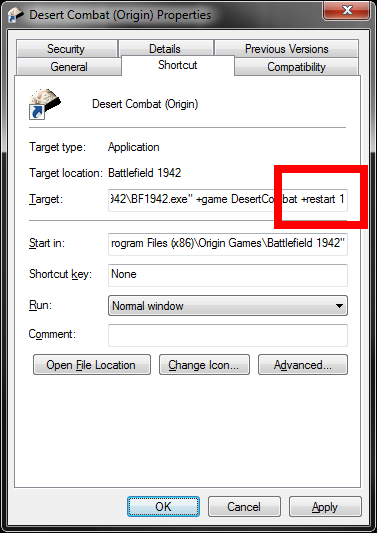 As of February 2014, the EA117 Desert Combat server is running a modified Origin-based server which will accept both CD-based Battlefield 1942 v1.61b game clients and also Origin-based Battlefield 1942 v1.612 game clients. 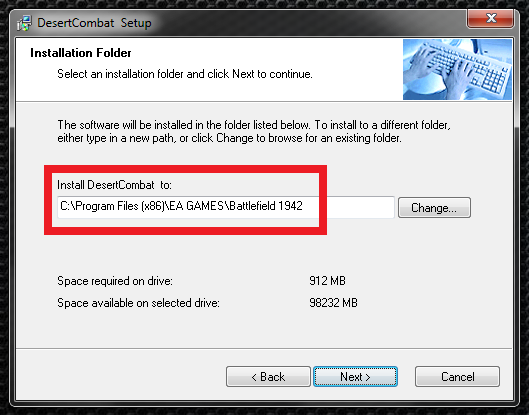 The following information describes the steps needed for someone to install and use the retail CD-based Battlefield 1942 game client to successfully play on the EA117 Desert Combat server. These instructions also include the fix necessary to mitigate the GameSpy master server shutdown that occurred in July 2014. 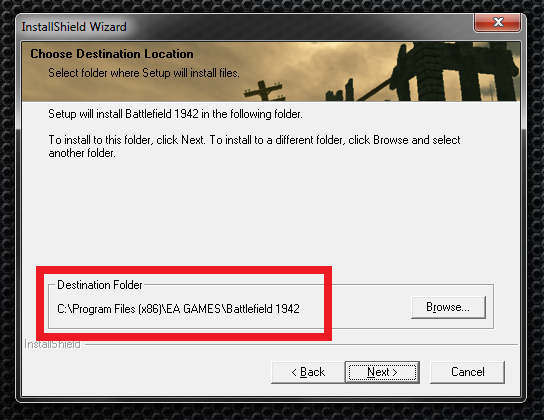 If your Battlefield 1942 installation is actually an Origin-downloaded game, you must use the information in HOW TO: Use an Origin-downloaded Battlefield 1942 game to play on the EA117 server instead. Enable DirectPlay on Windows 10. Install Battlefield 1942 from CD-ROM. Install the Battlefield 1942 1.6 update. Install the Battlefield 1942 1.61b update. Install the Desert Combat .7 mod. Install the Desert Combat Final .8 mod. Install Battlefield 1942 PunkBuster modules. Install the GameSpy master server shutdown fix. Update a desktop shortcut to launch Desert Combat and skip the intro movie and/or connect immediately to the EA117 server. Update Battlefield 1942 shortcut to launch BF1942.EXE using legacy Windows compatibility mode and 'Run as Administrator'. Check your Microsoft Windows Firewall or third-party firewall rules. Note: The following descriptions are written from the primary perspective of a 64-bit version of Windows 7 or later. If you are actually running a 32-bit version of Windows, or if you are running Windows XP, look for additional notes in each section for the different folder path, different registry path or different requirement that might be necessary for those versions of Windows. To determine which version of Windows you are running, press the Windows key + Pause key to bring up the "System" control panel applet and refer to the "Windows edition" and "System type" sections. Battlefield 1942 works great with Windows 10. But the Windows 10 platforms come with the legacy DirectX "DirectPlay" support disabled by default. Windows will attempt to prompt you to enable DirectPlay if you try to launch Battlefield 1942 without enabling DirectPlay first, but when the game is attempting to launch in full-screen mode you may or may not ever actually see this prompt. Select "Control Panel" from the menu that appears, and in the Control Panel select the link for "Uninstall a program" in the "Programs" section. 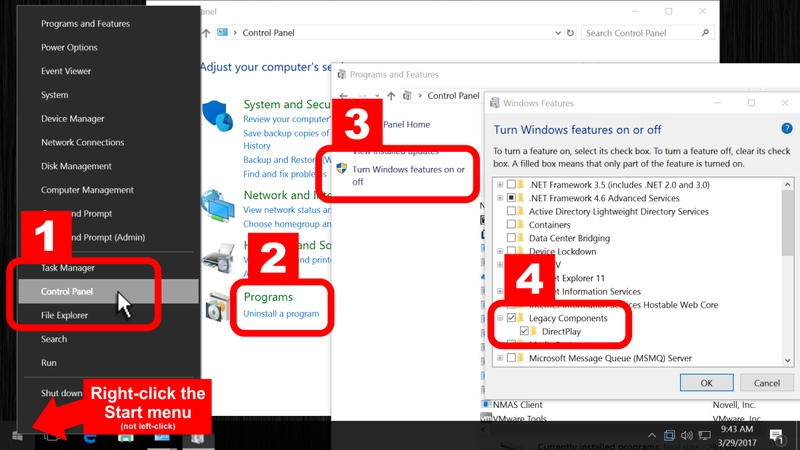 Select the link "Turn Windows features on or off" in the "Programs and Features" page, and then scroll down to find "Legacy Components". Expand "Legacy Components" and select the checkbox beside "DirectPlay" in that list. Press OK to save, and Windows will confirm successfully enabling the feature. 2. Install Battlefield 1942 from CD-ROM. Launch installation of Battlefield 1942 from CD-ROM normally, using the auto-run "Install" option or by running SETUP.EXE directly from the CD. After selecting your language, agreeing to the end user license agreement and entering your CD key, be sure to decline the "GameSpy Arcade" installation by selecting "No, install GameSpy Arcade later". Note: "Program Files (x86)" is the correct directory for 32-bit applications running on a 64-bit version of Windows. If you are actually running on a 32-bit version of Windows, then the correct directory is just "Program Files" and the correct destination path for the CD-based Battlefield 1942 game is "C:\Program Files\EA GAMES\Battlefield 1942". Proceed normally and finish installation from the Battlefield 1942 CD-ROMs. 3. Install the Battlefield 1942 1.6 update. 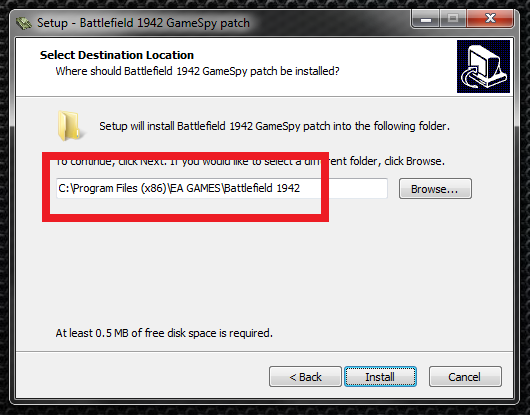 Download the Battlefield 1942 1.6 update (battlefield_1942_patch_v1.6.19.zip) from the EA117 server downloads page. Open the .ZIP file to extract and execute the contained "battlefield_1942_patch_v1.6.19.exe" installer program. Launch the program normally, and Windows itself will detect that this is an application installer and will automatically require "Run as Administrator" actions. 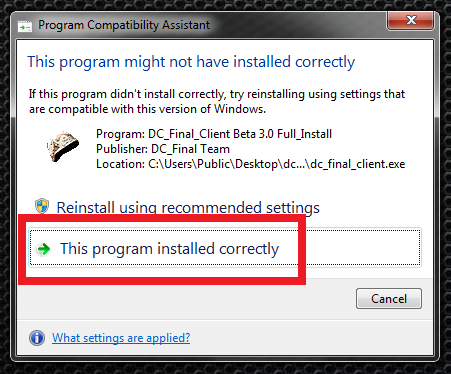 The installer will not prompt for a destination path, and automatically chooses the CD-based Battlefield 1942 program directory for installing the update. 4. Install the Battlefield 1942 1.61b update. Download the Battlefield 1942 1.61b update (bf1942_patch_v1.6_to_v1.61b.zip) from the EA117 server downloads page. Open the .ZIP file to extract and execute the contained "bf1942_patch_v1.6_to_v1.61b.exe" installer program. Launch the program normally, and Windows itself will detect that this is an application installer and will automatically require "Run as Administrator" actions. After making your language selection, the installer will not prompt for a destination path, and automatically chooses the CD-based Battlefield 1942 program directory for installing the update. 5. Install the Desert Combat .7 mod. 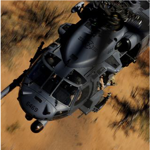 Download the Desert Combat .7 installer package (desertcombat0.7fullinstall.zip) from the EA117 server downloads page. Open the .ZIP file to extract and execute the contained "desertcombat0.7fullinstall.exe" installer program. Launch the program normally, and Windows itself will detect that this is an application installer and will automatically require "Run as Administrator" actions. 6. Install the Desert Combat Final .8 mod. 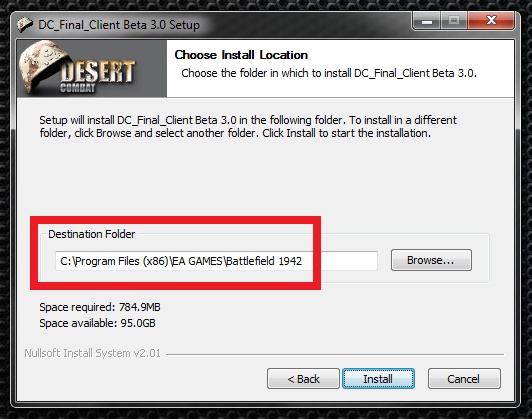 Download the Desert Combat Final .8 installer package (dc_final_client.zip) from the EA117 server downloads page. Open the .ZIP file to extract and execute the contained "dc_final_client.exe" installer program. Launch the program normally, and Windows itself will detect that this is an application installer and will automatically require "Run as Administrator" actions. 7. 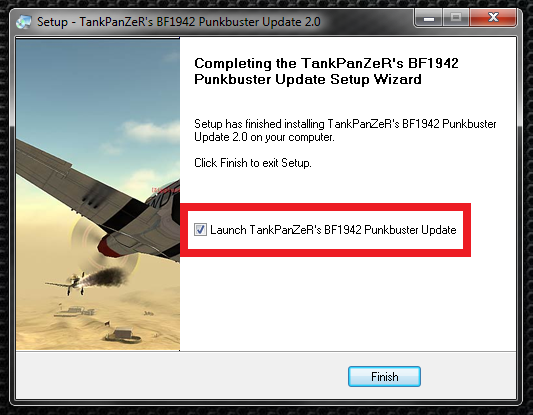 Install Battlefield 1942 PunkBuster modules. Note that Evenbalance's PunkBuster stopped supporting Battlefield 1942 several years ago, so there is not any "official PunkBuster download for Battlefield 1942" available from evenbalance.com any more. 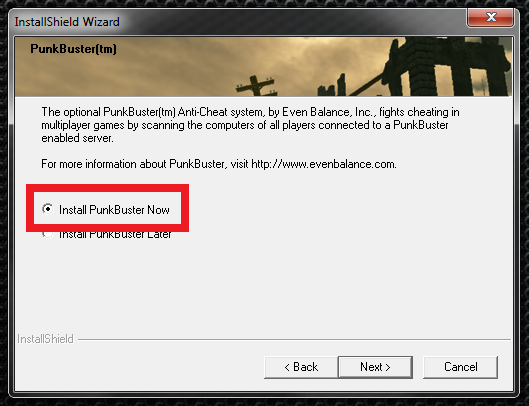 To enable PunkBuster support in Battlefield 1942, an additional update is required to install Battlefield 1942 files no longer available from evenbalance.com. 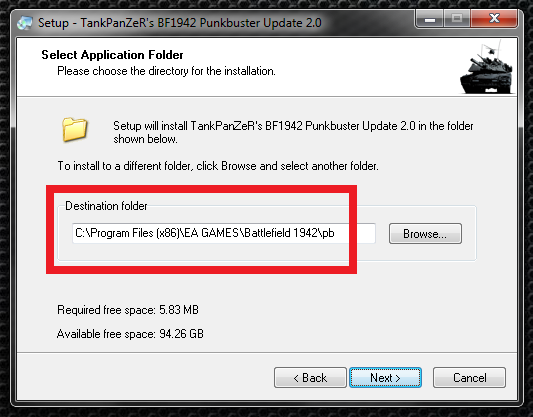 Download the Tank's PB Update ("TankPanZeR's BF1942 PunkBuster Update 2.0", TanksPBupdate.zip) from the EA117 server downloads page. Open the .ZIP file to extract and execute the contained "TanksPBupdate.exe" installer program. Launch the program normally, and Windows itself will detect that this is an application installer and will automatically require "Run as Administrator" actions. Note: "Program Files (x86)" is the correct directory for 32-bit applications running on a 64-bit version of Windows. If you are actually running on a 32-bit version of Windows, then the correct directory is just "Program Files" and the correct destination path for the CD-based Battlefield 1942 game is "C:\Program Files\EA GAMES\Battlefield 1942\pb". 8. Install the GameSpy shutdown fix. Download and execute the "Battlefield 1942 GameSpy patch v1.61" installer ("Battlefield 1942 GameSpy patch v1.61.exe") from the Team-SiMPLE downloads page. Fixes the hang that occurs accessing the "Internet" menu, if the master server Battlefield 1942 is using happens to be temporarily inaccessible. Changes the master server used by Battlefield 1942 to "master.b1942.sk", instead of the "master.gamespy.com" server which is now permanently shut down. Full widescreen support, including being able to list all supported resolutions of your video card from the in-game Battlefield 1942 "Video" configuration menu. The desired resolution can simply be selected normally, without having to manually edit the video.con file, without having to mark the file read-only, etc. More information regarding the "Battlefield 1942 GameSpy patch" can be found in the Team-SiMPLE forums. If desired, alternatives to using a modified BF1942.EXE to solve the GameSpy shutdown hang are discussed in the EA117 GameSpy shutdown information page. A. Update a desktop shortcut to launch Desert Combat and skip the intro movie and/or connect immediately to the EA117 server. For whichever shortcut you prefer to use for launching the CD-based Battlefield 1942 game, it can be helpful to add the "+restart 1" option to the shortcut in order to skip the introduction movie, rather than having to wait and cancel out of it every time you start the Battlefield 1942 game. Right-click on your desktop shortcut and select "Properties", and then on the "Shortcut" tab find the "Target:" edit field which contains the full path and command line to be executed by the shortcut. You do not want to remove any options which are already present, and simply want to add a space and the "+restart 1" option to the end of whatever command line is already being executed. For example, on the shortcut created by the Desert Combat .7 modification installer, there would already be a "+game DesertCombat" option specified at the end of the existing "Target:" command line. You simply want to add the restart option in addition to that, so that the specified options are now "+game DesertCombat +restart 1". Note that this change only applies to the shortcut you right-clicked and selected "Properties" on, so if you use multiple different shortcuts for launching Battlefield 1942, you will need to make the same modification to all of them. Similarly, if you wanted to modify a Battlefield 1942 shortcut to connect immediately to the EA117 server upon launching, you can add a space and "+joinServer 108.61.17.59:14567" to the command line specified in the "Target:" field of the shortcut. B. Update Battlefield 1942 shortcut to launch BF1942.EXE using legacy Windows compatibility mode and 'Run as Administrator'. If you used the "Battlefield 1942 GameSpy patch v1.61" installer from Step 8, this change has already been automatically performed for you. Note that for some players, setting the Windows compatibility mode to "Windows NT 4.0 (Service Pack 5)" instead of "Windows XP (Service Pack 3)" avoids crashes that occur when Battlefield 1942 is loading maps. However, Windows 8 and later actually removed the "Windows NT 4.0 (Service Pack 5)" option, so "Windows XP (Service Pack 3)" might still be your only choice unless you are running on Windows 7. 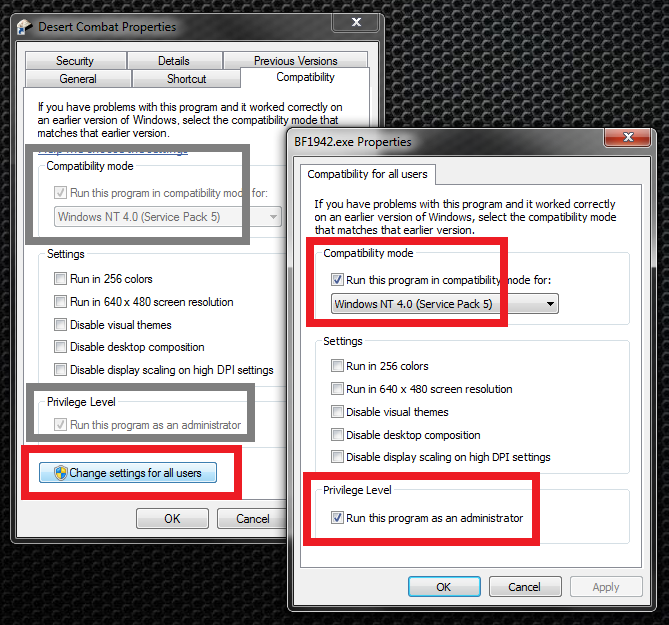 To manually verify or change these settings, right-click the desktop shortcut created for Battlefield 1942, and on the "Compatibility" tab select the option "Run this program in compatibility mode" and select "Windows XP (Service Pack 3)" (or "Windows NT 4.0 (Service Pack 5)", if available). Also select the option "Run this program as an administrator". Note this configuration is only necessary and available on Windows 7 and later; for Windows XP this step is not required. Also note that Windows saves this change "for BF1942.EXE" and not as part of the shortcut itself. Meaning once you have updated the "Compatibility" tab on this shortcut, all the other shortcuts to this same BF1942.EXE in this same directory will also run with Windows XP SP3 compatibility and 'Run as Administrator', without having to update each individual shortcut. C. Check your Microsoft Windows Firewall or third-party firewall rules. When Battlefield 1942 is installed from CD-ROM, typically there will not have been a Microsoft Windows Firewall rule entry created for the Battlefield 1942 game itself (BF1942.EXE). If you downloaded the PunkBuster core services as part of another Origin-provided game such as Battlefield 3 or Battlefield 4, Origin will have already created Microsoft Windows Firewall rule entry for the PunkBuster core services "PnkBstrA.exe" and "PnkBstrB.exe". But if you had to install PunkBuster core services a different way, it may be necessary to verify that Microsoft Windows Firewall rules for the CD-based Battlefield 1942 (BF1942.EXE) program and the PunkBuster core services ("PnkBstrA.exe" and "PnkBstrB.exe") were indeed created. You can view the current Microsoft Windows Firewall rules by opening the "Network and Sharing Center" from the Windows Control Panel, and then using the "Windows Firewall" link on that page to bring up the Windows Firewall configuration page. 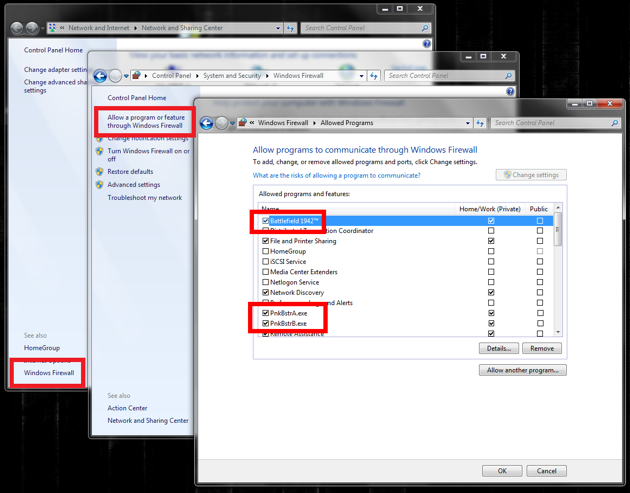 Invoke the "Allow a program or feature through Windows Firewall" link to see the current list of programs for which a rule has been created. For "PnkBstrA.exe" and "PnkBstrB.exe", on 64-bit versions of Windows you must use the "Allow another program" button to browse to the "C:\Windows\SysWOW64" directory (not SYSTEM32) because the PunkBuster services are 32-bit programs and are not kept in the SYSTEM32 directory on 64-bit Windows machines. On 32-bit versions of Windows, you will browse to "C:\Windows\SYSTEM32" to find "PnkBstrA.exe" and "PnkBstrB.exe". You must add each program separately as its own Windows Firewall rule. If your Windows computer has some other third-party firewall installed instead of Microsoft Windows Firewall (for example, McAfee, Symantec, ESET, etc. 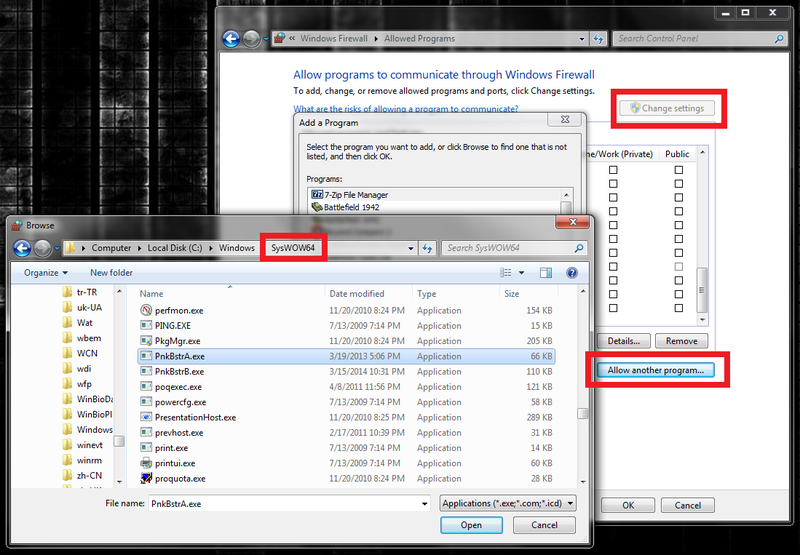 ), you will of course have to use whatever configuration dialogs and methods the third-party firewall software provides, instead of the Microsoft Windows Firewall-specific examples shown above. Added "Enable DirectPlay (Windows 10 systems only)" as a required step, to help those re-building Windows 10-based gaming systems. Added an http://ea117.com/dcinstall alias for reaching this document, in case you need to more easily refer someone to it.